The Red Sox, declaring David Ortiz as perhaps the greatest player in franchise history Sunday, treated him with such a glorious and splendid farewell ceremony, you almost forgot the Red Sox still have a playoff series ahead. The Boston Red Sox, declaring David Ortiz as perhaps the greatest player in franchise history, treated him with such a magnificent and celebrated farewell ceremony Sunday, you almost forgot they still have a postseason to attend. The 50-minute ceremony had a bit of everything. The president of the Dominican Republic, the governor of Massachusetts and the mayor of Boston. Solid gold bats and walking boots. A seven-figure charity donation. A retired number. Famous Red Sox alumni. World Series trophies. Flash cards in the stands. Bridges and streets named in his honor. Fellowship programs in his name. Even a virtual pardon by the commissioner’s office for a positive drug test. “It was unbelievable," said Ortiz said, playing in the Red Sox’s final regular-season game at Fenway Park. “It was more than what I expected. They even shut down my country in the Dominican. “This organization did something I’ll never forget." “Any time you have bridges and roads named after you," Red Sox manager John Farrell said, “you built one hell of a legacy." Perhaps, Farrell says candidly, the greatest to ever wear a uniform. “It would be a great debate, and there would be plenty of support for those other great names," Farrell said, “but he may be the most important player in franchise history to date." The Red Sox, validating Farrell’s claim, didn’t even bother to wait for Ortiz to reach the Hall of Fame before retiring his number, 34. Yep, right alongside Yaz, Ted Williams and the other Red Sox greats. Why wait for the future when you can honor him now? “He changed the Red Sox," said Commissioner Rob Manfred, who created a fellowship in Ortiz’s honor aimed at increasing front-office diversity. “Obviously, he was a key part of the amazing three (World Series titles) they had here. He changed the course of this franchise. “I also think he changed the city." When Ortiz took the microphone this time at Fenway Park, after the ceremony ended with Grammy award singer Mary J. Blige crooning in his honor, there were no famous profanities as in the aftermath of the Boston Marathon bombings. No signs of bravado. Only gratitude. And tears. Ortiz, 40, embraced all of his former teammates from their three World Series championship teams who entered the field from the center-field wall, everyone from Pedro Martinez to Manny Ramirez to Mike Lowell to Curt Schilling to Jonny Gomes. He caught the first ceremonial pitch from Danilo Medina, president of the Dominican Republic, and even grabbed his phone out of his back pocket, and took a selfie. Yet, when he started to thank everyone along the way, and brought up his mother, Angela Rosa Aria, who died in a car accident in 2002, he broke down crying. “I love you so much," he said, “and I miss you." The crowd of 36,787, with many wearing the special edition $150 Ortiz jerseys or $60 Ortiz farewell T-shirts, cried right along with him. “I had all my family on the field," Ortiz said, “but I feel like something was missing. When it comes down to talking about my mom, emotion comes through once you start thinking about a member of the family that is no longer around." 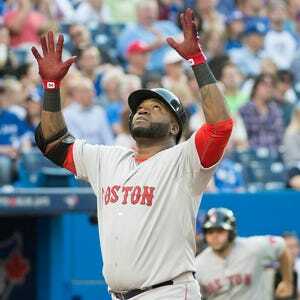 Ortiz is family in New England, and when he looked and pointed toward the heavens each time he crossed home plate after hitting his 541 homers, they felt his emotion, too. If Big Papi hasn’t already done enough for this city, with his postseason walk-off homers, World Series motivational speeches, and impassioned plea to a city healing from the Boston Marathon bombing, he delivered an encore, producing the greatest final season in baseball history with his 38 homers and 127 RBI. “I really can’t believe he’s retiring, not after the season he just had," said Toronto Blue Jays manager John Gibbons, whose team wound up clinching the American League’s top wild-card berth, with a 2-1 victory. “The guy has been absolutely amazing." Next stop, after the World Series concludes, will be Cooperstown, N.Y., home of the Hall of Fame. And just in case someone wants to hold that positive drug test during 2003 survey testing against him, Manfred all but campaigned for his candidacy, noting that perhaps Ortiz’s test result may have actually been a mistake. There were at least 10 false positives in the drug testing survey, Manfred said, and who knows, perhaps Ortiz was one of them; he has maintained he does not know how he could have tested positive. “We were not certain it was a banned substance," Manfred said, “as opposed to something that was available over the counter and legal. “What I do feel is unfair that in situations where it is leaks, rumors, innuendo, not confirmed, positive-tests results, that is unfair to the players. I think that would be wrong." Sunday, Ortiz’s biggest quandary was finding a place to stash his gifts. Where are you going to store a golf cart, surfboard, cable car bell, broken telephone, solid gold bat, oil paintings, cowboy hat, cigar humidor, wine and chairs? If nothing else, maybe he could store them on his own bridge and street. Ortiz stood there covering his mouth in disbelief when government officials announced the bridge over the Massachusetts Turnpike will now be called the David Ortiz Bridge, and a segment of Yawkey Way will be called David Ortiz Drive. “Man, I tell you, I can’t believe that happened," Ortiz said. “I might go there for a day and just drive back and forth." Ortiz thanked everyone he could during the ceremony, and again after the game, from the Red Sox ownership group who donated $1 million, to his current and former teammates, the media, and of course, the fans. He even dropped to a knee during the ceremony, tipped his cap, and said, “You are the best." It didn’t matter that Ortiz was hitless in four at-bats during the game, striking out twice, or even that the Red Sox lost. They gave him a standing ovation every time he stepped to the plate. And another one each time walked back to the dugout. “I’m exhausted," Ortiz said. “I’m not going to lie to you. It caught up with me a little. It was pretty obvious during the game. “I’m so happy that it is over so I can focus on what is coming up next." Oh yeah, there’s the playoffs.